I'm always looking for unique gifts to give my family. Things that you can't find in every store you go in, things that your friends don't have, etc. When LoveBook contacted me to do a review, I knew I wanted to right away. My husband's birthday is April 20th, so the timing couldn't have been better. I was able to customize the cover with one of their already designed covers and then put my special note at the bottom. Those are just a few of the pages I put inside my husband's book. Truly I know he'll love this when I give it to him for his Birthday. He's turning 30, which is a pretty big deal, but he has everything he could ever want or need so this is something so unique and I know he'll appreciate it. Making the book was super easy. They have thousands of pre made pages to choose from OR you can add blank pages and make up your own to really make it custom and let your loved one know how much you appreciate and love them. The entire process took me about 25 minutes. Each book comes with a standard 20 pages, but you can do as many as you want for the same great low price!!! AWESOME!! You can also arrange and rearrange the pages to be in the order you want them in. When you're all done, you just preview it and then check out. It is a really easy process and anybody would love to receive this for a gift. Also from the day I ordered it until it was in my hands was 4 days!! They printed it and shipped it that day or the next, it was super fast making this a nice last minute gift too. Overall: ***** I know he'l love it and the process was quick. 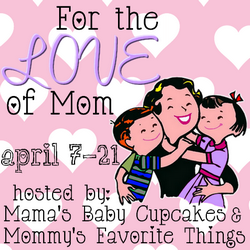 For the Love of Mom, LoveBook is giving one reader the chance to win a Hardcover book! Giveaway goes live April 7th! I love personalized gifts and this would be perfect for a keepsake to have and cherish for many years.